The cow is an intricate beast with many undervalued pieces of meat within its bodily makeup.While we've grown accustomed to cuts of beef we can easily grab at the grocery store, such as tenderloin, ribeye or t-bone, there are so many unique cuts, that unless you're a whole animal butcher, you might not be too keen on. 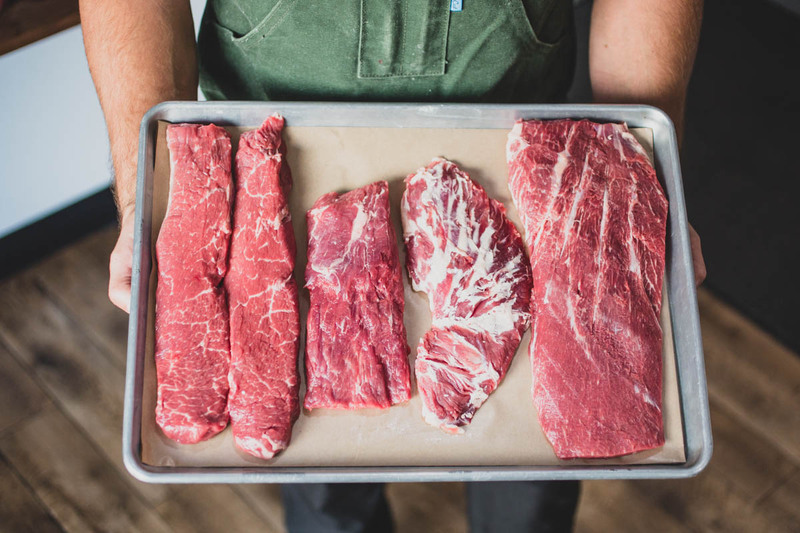 We reached out to our friends at Electric City Butcher in Santa Ana, California and picked their brains on special cuts of beef that the general public doesn't typically know about. 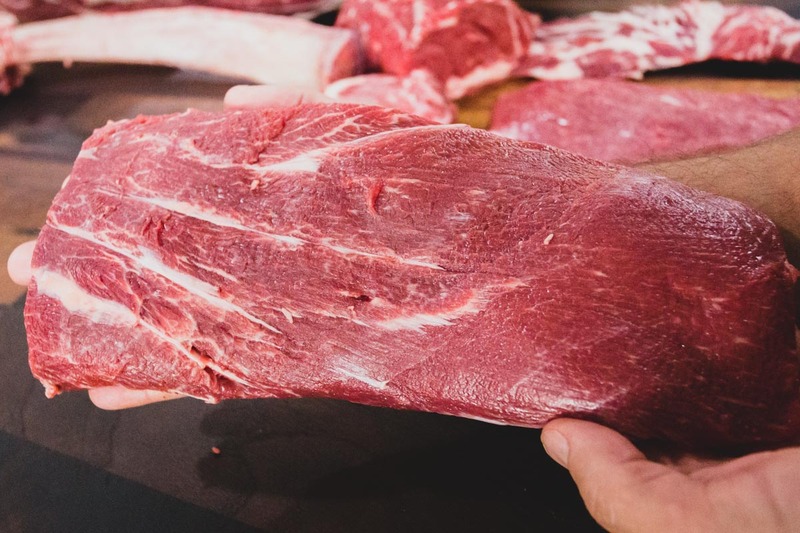 Steven Sabicer and Michael Puglisi conduct whole animal butchery at their shop, which means they don't just work with bits and pieces of the cow like most butchers, they cut through the whole damn thing. 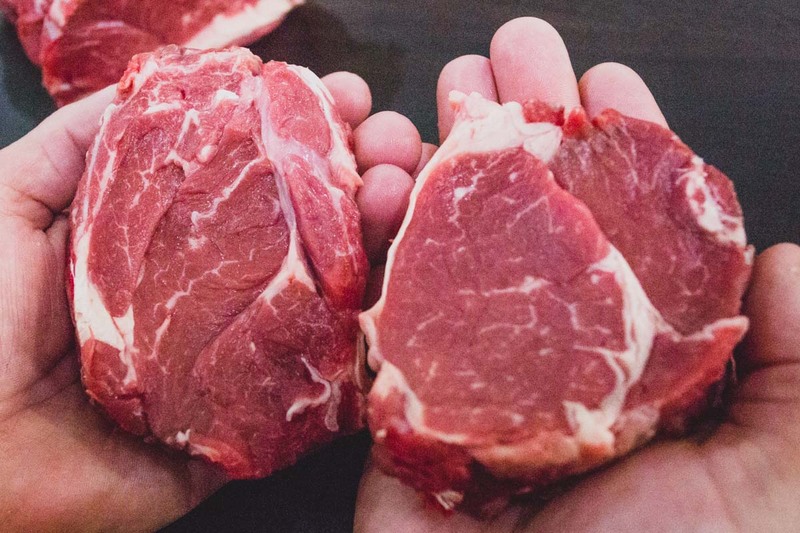 I want to emphasize the whole animal aspect of their craft, because I called in to multiple respected and knowledgeable butcher shops, and even they sounded befuddled when I asked if they had some of these cuts in their shop. These are not your average steaks, and each provide a specific flavor profile that can upgrade your usual grilling routine. If you have a whole animal butcher nearby, take full advantage. If you don't, hopefully this guide can help your local butcher get an idea of where the piece of meat is and offer it to your liking. The Flat-Iron is enticing for its marbling. Steak lovers know all about the value of a nicely marbled steak, and the flat iron cut provides that, without the high price you'd expect from other cuts such as ribeye or New York Strip. Because of its cheaper price point, it has been served in more restaurants lately. 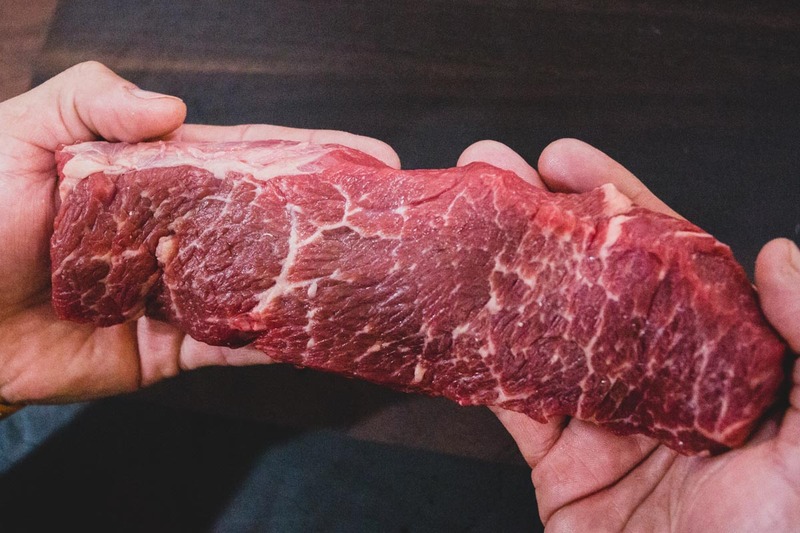 To find it, the flat iron is found right under the cow's shoulder blades, and the rarity comes from the fact that there are only six to 8 pounds of it available per cow. Even then, with one cut, you can feed three to four people. "Sear the flat iron in a hot cast iron pan with a little bit of rendered beef fat. Make sure that the fat is smoking before you drop the steak in. Flip it after 3-4 minutes, and then let it cook for at least 3-4 more minutes, testing for doneness. Remove it from the heat and let it sit for up to 20 minutes. Slice against the grain and serve." The oyster steak, AKA the spider steak, AKA the butcher's steak, AKA the crotch steak, is unmistakable for the fatty inner-tissue fibers that resemble a spider web. The oyster steak is found in the cow's hip pocket, or the crotch, as the Electric City Butchers pointed out. It is "almost too small to sell, and is the perfect size for a hearty butcher's lunch," Sabicer explained. There are only two oyster steaks in the cow, and each weighs about eight ounces. It's the hardest cut for butchers to get to, as it cannot be removed until the entire cow is de-boned, adding yet another layer to why it's so rare to see. It is very thin, so it quickly cooks in 30 seconds to 1 minute in high heat. The Denver steak comes from a chuck roll, which is the fattiest, and most flavorful part of the cow. Sabicer compares the Denver steak to pork shoulder, but in beef form, of course. The reason you don't see the Denver steak much, is because it is difficult to break down, and is easier to use for ground beef. If your butcher knows what he's doing, and can actually cut this beef into a steak. This tender cut is a flavorful way to get the best bang for your buck. But even then, there's only about 12 steaks per cow. Puglisi recommends this steak be pan seared, and since they're thin, they cook faster on high heat, so keep an eye on it for doneness. 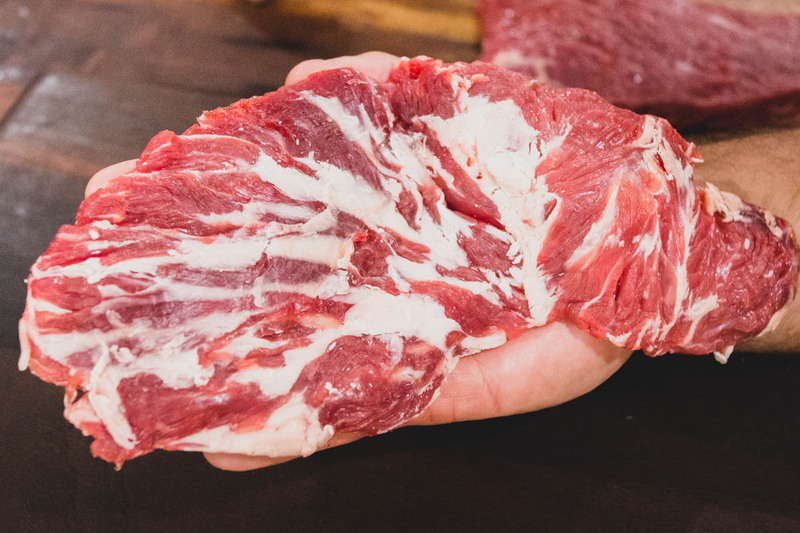 The bavette comes from the same area as a flank steak and has a similar chewy and lean consistency. If you're not careful, it can even be mistaken for a flank or flap steak, however the Bavette is thicker and more tender. A cow will only carry about 10 pounds of bavette on it, which is a fraction considering the steed could weigh up to 650 pounds on average. 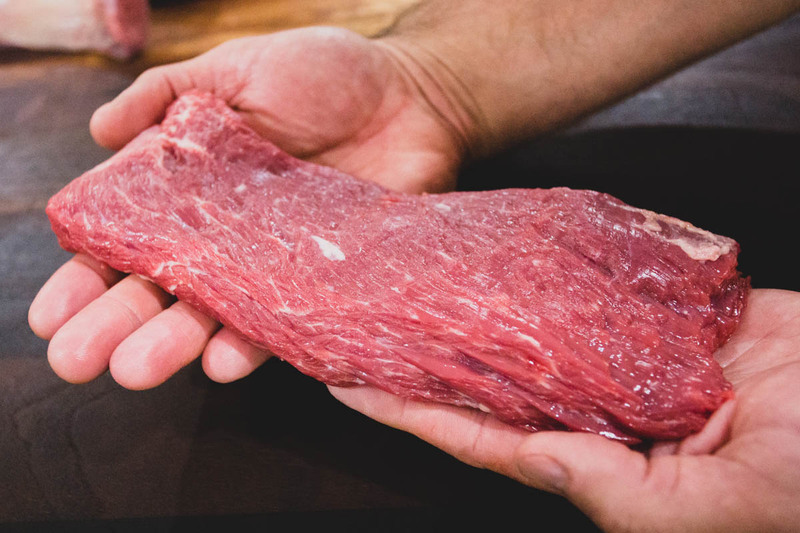 "This steak has become very popular in recent years, and there isn't a whole animal butcher in America that isn't asked about bavette," explains Sabicer. "Fast, fast, fast, and cut against the grain." You can pan sear or grill this on high heat, but just keep in mind that there's no time to let it sit in the heat, as it cooks fast. The chuck eye is known as the poor-man's ribeye, which isn't necessarily a bad thing. The chuck eye "Is the beginning of ribeye," Puglisi clarifies. There are only two chuck eyes per cow, and being so close to the ribeye family, you can actually get away with some ribeye flavor, without the ribeye price point, hence the "poor man's ribeye" title. Chucks are usually braised, roasted or stewed, but when the butcher cuts it into a chuck eye steak, you can actually grill or pan sear it to get a better flavor profile, closer to ribeye. Salt and pepper it liberally. Like, very liberally. Don't be afraid to treat yourself with a little herb butter on this one.